For the Chinese weapon, see Butterfly sword. A balisong, also known as a fan knife, butterfly knife or Batangas knife, is a folding pocketknife. Its distinct features are two handles counter-rotating around the tang such that, when closed, the blade is concealed within grooves in the handles. 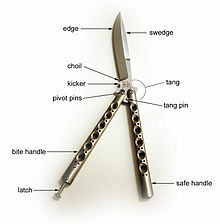 A balisong with the latch on the "safe" handle, opposite the cutting edge, is called a Bite Handle. The name "balisong" is likely derived from barangay Balisong, part of the municipality of Taal, Batangas province, which along with the neighboring barangay Pandayan, were the original manufacturing centers of the knives in the Philippines. The two barangays were home to a blacksmith industry that also produced other bladed implements like bolo knives. It is also claimed that the meaning of the term balisong is derived from the Tagalog words baling sungay (literally, "broken/folding horn") as the hilt of the blade were traditionally made from carved carabao and deer horn, as well as bones. The traditional balisong is also known as veinte y nueve in the Philippines, because they are 29 cm (11 in) long when opened. Other names for the knives in English include "fan knives" and "butterfly knives" from the motion, and "click clacks" from the sound they make when they are opened and closed. The origin of the knives is unclear. Oral histories claim that the knives were first created in the Philippines in 800 CE. However, there is no documentation or archeological evidence to back this. Balisong mass production in the Philippines can only be attested to the early 1900s. Another claim is that balisong were originally an adaptation of a French measuring tool called the pied du roi ("foot of the king"), invented between the 1500s to the late 1700s. However, how it was introduced to the Philippines is unknown. There are theories that it may have been introduced by sailors in the Spanish Empire, which was then allied to France. Regardless of the origin, the modern balisong was perfected in the Philippines, where it became much larger and were predominantly used as a weapon and not just a tool. The quick opening techniques ("flipping") were also developed in the Philippines. In contrast, the French pied du roi was primarily a folding ruler, with the knife only included in some specimens as a novelty. They were cumbersome to open and unlikely to be used for self-defense, especially since they also commonly included a metal tang at the end of the handle to aid in measuring. There were also very similar designs to the balisong produced in England in the late 19th century, presumably also derived from the pied du roi. But like the latter they were primarily utilitarian tools. Some balisongs, like the Benchmade 51, do not use Tang Pins. Instead, it uses "Zen Pins", which are two small pins embedded in the handles of the balisong which make contact with the bottom of the blade. A balisong with zen pins negates the problem of having the tang pin fall out (as with some cheaper models). Parts of a Benchmade 42. Screws mounted inside the handles that collide with the kicker mounted on the tang to prevent the blade from moving around while in the open or closed position. The blade is the piece of steel that runs down the center of the knife that is secured by both handles when closed. One edge of the blade is sharp and will cut the user if they are not careful, especially when flipping the knife. The other edge, called the swedge, is blunt and won't cut the user. The swedge commonly impacts the users hand when flipping. The balisong has been outlawed in several countries. In the Philippines, it is now generally illegal to carry one without identification or a proper permit in the streets of the capital because of their prevalent use in crimes and altercations. One now needs to demonstrate the need in professional livelihood or utilitarian purpose (such as cutting grass, preparing fruits and meats, being a vendor of knives, being martial arts instructors, etc.) to be able to walk around with bladed implements in the urban areas. Another rule of thumb is that the blade of pocket knives must not exceed the length of the palm and must not be openable by one hand in order to be considered as a utility knife as opposed to a weapon (thus, Swiss Army Knives are legal). In Australia, balisongs are generally classified as a prohibited weapon, which requires a special legitimate excuse to possess it. Australian Legal Definition: A flick knife (or other similar device) that has a blade which opens automatically by gravity or centripetal acceleration or by any pressure applied to a button, spring or device in or attached to the handle of the knife. In Canada, although not specified by name as a prohibited weapon, the balisong knife is often considered by courts to fall under the "gravity knife" or a centripetal classification and is, therefore, prohibited, unless grandfathered in before prohibition. In Sweden it's illegal to carry, import or trade a balisong; legal to own and collect. In the United Kingdom, the balisong has been legally classified as an offensive weapon since January 1989. While they are legal to possess, carrying one in public is an offence under the Prevention of Crime Act 1953. Sale, lending, hiring, giving or importing is prohibited by the Criminal Justice Act 1988, as amended by the Offensive Weapons Act 1996. Any imported are liable to be seized and prosecution may follow. The exception to this are knives of this type over 100 years old which are classed as antiques. In Switzerland, balisongs are illegal to carry, give, lend, buy, or trade. In Germany, the balisong was outlawed when the Waffengesetz (weapons law) was tightened in April 2003 in the aftermath of the Erfurt massacre. Thus buying, possessing, lending, using, carrying, crafting, altering and trading it is illegal and is punishable by up to five years imprisonment, confiscation of the knife and a fine of up to €10,000. Using a butterfly knife for crime of any kind – as is any illegal weapon – is punishable by from 1 to 10 years imprisonment. In Finland, balisongs are legal to be purchased, sold and possessed, and are treated just like regular knives and befall under the edged weapons law. Carrying one in public is permitted if the person carrying one can prove it is used as a tool. In the Republic of Ireland, butterfly knives are illegal offensive weapons. In Lithuania, balisongs among other knives are legal to possess and carry as they are not considered weapons. This excludes switchblades. In Poland, balisongs, switchblades and gravity knives are treated like normal knives. In Russia, balisongs are legal only if the length of the blade is not more than 90 mm. In some United States states, it is illegal to possess or carry such a knife in public. In certain jurisdictions, balisongs are categorized as a "gravity knife", "switchblade", or "dagger". In the state of Florida, it is legal to own and carry balisongs. 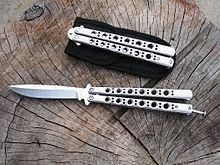 In Hawaii, it is illegal to possess, manufacture, sell, transfer, or transport any balisong/Butterfly-type knife. There were once legal restrictions on butterfly knives in Kansas. However, as of July 2013[update], the Kansas Comprehensive Knife Rights Act decriminalized the carrying of all types of bladed weapons. In Illinois, it is legal to own and carry a butterfly knife. In Chicago it is illegal to carry concealed a knife with a blade longer than 2.5 inches. Concealed carry of a double-edged knife is prohibited. Automatic (switchblade) and gravity knives are prohibited. In Indiana it is legal to own and carry a butterfly knife both open or concealed. In Kentucky, the balisong is legal for concealed and open carrying anywhere one is not otherwise prohibited from carrying a concealed deadly weapon. Kentucky's constitution and revised statutes prohibit cities and counties from enacting weapons laws and restrictions. In Massachusetts, the balisong is legal for concealed and open carrying so long as it does not "[present] an objective threat of danger to a person of reasonable and average sensibility." Restrictions also apply depending on the area of the person carrying the knife (such as within a public school). In Michigan, the balisong is legal because it is classified as a "folding knife"
In New Jersey the criminal law, NJSA 2C:39-1, suggests balisongs are illegal but the question of legality or illegality is an open question. In New Mexico, possession of a butterfly knife is illegal, because the butterfly knife is a "switchblade" within the meaning of the statute making possession of switchblades unlawful. In North Carolina, citizens are allowed to carry most pocketknives most of the time. Statute S.14-269, which prohibits the concealed carrying of any "bowie knife, dirk, dagger", or "other deadly weapon of like kind" doesn't apply to an "ordinary pocket knife carried in a closed position". In North Dakota, it is legal to own a balisong and carry it openly, however they are illegal to carry concealed, as they are considered to be deadly weapons. In Ohio, it is legal to own a balisong and carry it openly, however they are illegal to carry concealed, as they are considered to be deadly weapons. in Oklahoma, the balisong is legal for open carry but is illegal to carry concealed. In Oregon, it is illegal to carry a concealed balisong. In Maine, it is illegal to carry a balisong, mainly due to personal injury. In Texas, switchblades are legal as of 1 September 2013[update]. In Utah, Balisongs are legal to own and carry, as long as you are not a "Restricted Person" as described in Utah State Code §76-10-503 . In Virginia, the balisong is legal for concealed, and open, carrying according to state law. In Washington, the balisong is classified as a "spring blade knife", and under state law one cannot manufacture, sell, dispose of, or possess such knives. In France, balisongs are legal to own if you are over 18 years old but it's illegal to carry one around without very special authorization. In Italy, balisongs are legal to own if they are not sharpened on both sides, but it's illegal to carry one around without a justified reason. In New Zealand balisongs are illegal. In the Netherlands balisongs are illegal. In Norway balisongs are illegal. ^ Jaser A. Marasigan (August 3, 2006). "Sublian Festival Batagueño pride". www.mb.com.ph. Archived from the original on 2012-11-28. Retrieved 2007-05-14. ^ "Balisong". Taal Heritage Town. ^ "Balisong Art by Master Ona". Journey Under Blue Skies. Retrieved 7 January 2019. ^ a b Brown, Trevor. "Butterfly Knife History". Blade Magazine. Retrieved 7 January 2019. ^ a b Morel, Guillaume. "Between myth & reality". Balisong.net. Retrieved 7 January 2019. ^ "The History of the Balisong: What little I know of it". The Balisong Collector's Page. Retrieved 7 January 2019. ^ "UK Offensive Weapons Act 1988". Retrieved 2006-11-05. ^ "PeiliĹł civilinÄ—s apyvartos teisinis reglamentavimas". knives.lt. Retrieved 2013-12-21. ^ "Apie asociacijÄ…, peilius ir viskÄ…, kas su tuo susijÄ™..." knives.lt. Retrieved 2013-12-21. ^ "California Knife and Balisong Law". knifeup.com. 2013-01-07. Retrieved 28 February 2019. ^ "Knife Law: Florida | KnifeHog". KnifeHog. 2014-10-18. ^ "Deadly weapons and knives". Honolulu Police Department. Archived from the original on 2012-03-17. ^ "Kansas Knife Laws". knifeup.com. 2013-02-19. Retrieved 2013-02-12. ^ "Kansas Comprehensive Knife Rights Act" (PDF). 2013-06-05. Retrieved 2013-06-26. ^ "Illinois Knife Law - KnifeUp". www.knifeup.com. ^ "Indiana Knife Laws - KnifeUp". www.knifeup.com. ^ "Massachusetts Knife Law | KnifeUp". www.knifeup.com. Retrieved 2016-11-07. ^ State of New Mexico v. Riddall, 112 N.M. 78, 811 P.2d 576 (N.M. App. 1991). ^ NMSA 1978, Section 30-7-8. ^ "Knives and the Right to Bear Arms". North Carolina Criminal Law. 2015-02-23. Retrieved 2017-03-22. ^ "ORS 166.240 – Carrying of concealed weapons – 2011 Oregon Revised Statutes". Oregonlaws.org. 2012-03-25. Retrieved 2013-12-21. ^ "RCW 9.41.250 Dangerous weapons—Penalty". ^ "Forskrift om skytevåpen, våpendeler og am § 9.Forbud mot våpen eller lignende som ikke faller innenfor våpenloven § 1".